Originally Submitted to FurAffinity.net on Sep 15th, 2012 12:11 AM. Before it was transferred to Inkbunny it had 215 views and 15 favorites. In this picture I drew the Dragon Ball Z character Lord Cooler. He is the brother of Lord Frieza. Lord Cooler is also known by other spellings such as Lord Kooler, Lord Koola and Lord Coola. In half the cases, the 'Lord' part is dropped. 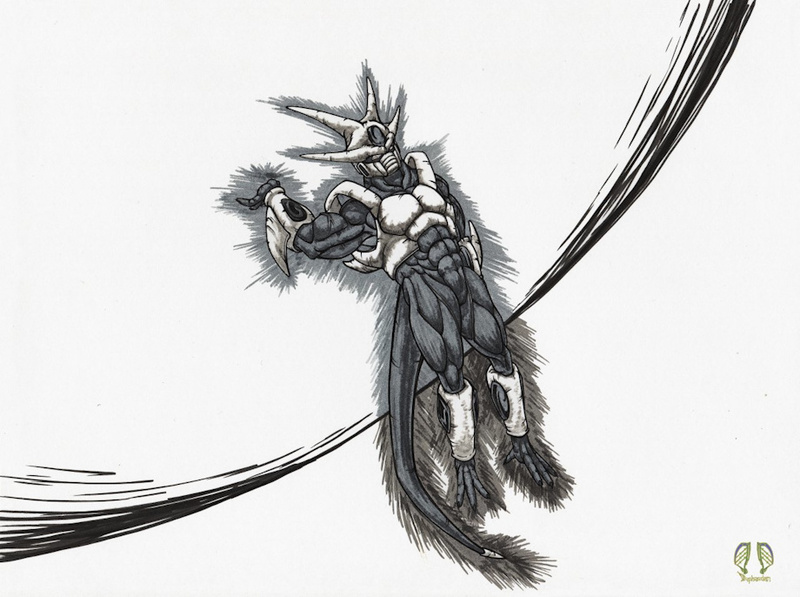 Here, Lord Cooler is in his 6th form such as shown in the Dragon Ball Z movie Cooler's Revenge. In this situation he has quickly, casually and effortlessly created large energy ball, the move being called Supernova, to destroy an entire planet and all those that live upon the surface. Knowing his character would reveal that he will likely delight in doing so. ^\/^. I tried to show him as looking more awesome by adding a dark like aura around him. Knowing that the Supernova move would make the Aura look different for the part showing between the viewer and the Supernova, I used a differed ink brush pen to simulate the difference. I stroked it in such a way to insinuate the character being of such evil nature that the evil aura simply emanates from his powerful ripped body like light rays. Only the rays are not light but of pure darkness. I wish there was an aura like that in some of the DBZ fighting games, but most are simply different colors of classic auras or auras that look like key character's auras. Pitty. LOL. ^\/^.